The coming of the railways in the 1830s killed off the stage-coach trade; almost all rural roads reverted to low-level local use. Cyclists were the first group in a generation to use roads and were the first to push for high-quality leadership for roads. They were also the first promoters of motoring; the first motoring journalists had first been cycling journalists; and there was a transfer of technology from cycling to motoring without which cars as we know them wouldn't exist! 64 car marques, including Rolls-Royce, Aston Martin, Chevrolet, Cadillac and GMC, had bicycling beginnings. 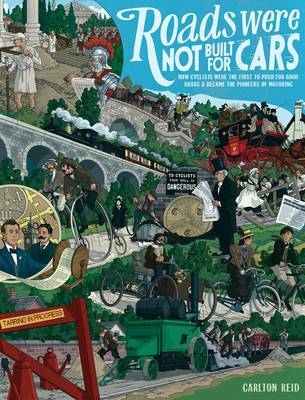 Roads Were Not Built for Cars is a history book, focussing on a time when cyclists had political clout, in Britain and especially in America. The book researches the Roads Improvement Association - a lobbying group created by the Cyclists' Touring Club in 1886 - and the Good Roads movement organised by the League of American Wheelmen in the same period.